While economic improvement has been prevalent in recent years, many communities – like those in Detroit and Chicago – continue to struggle. As such, Americans continue to identify economic reform as a key policy issue. But creating economic opportunity is often easier said than done. To some, access to financial resources remains out of reach, while others see their innovation stifled by lack of opportunity. Thankfully, JPMorgan Chase launched a major initiative called AdvancingCities Challenge to assist in boosting economic growth. JPMorgan Chase has identified four major drivers for creating economic opportunity. First, workers need to be trained and developed to have modern day skills relevant to the marketplace. Second, individuals, especially women and minority entrepreneurs, need to have access to financial capital and expertise in order to excel. Also, creating economic opportunity within communities demand local solutions. Lastly, JPMorgan Chase believes empowering the family financial situation is also essential. These four drivers comprise JPMorgan Chase’s “Model for Impact” that serves as the foundation for AdvancingCities. 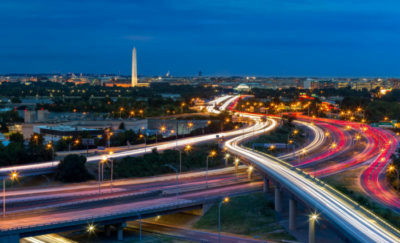 Detroit, Chicago, and Washington D.C. have shown strong results under this model. So now, JPMorgan Chase is expanding its mission and outreach for creating economic opportunity. Innovation Support – The ability to pave the way for startups and entrepreneurs is essential in creating economic opportunity. Innovation drives job creation, which drives community growth and revenues. This is a focus of JPMorgan Chase’s AdvancingCities Challenge. Resource Access – Individuals and small businesses need access to financial resources to thrive. Workers need access to training and development opportunities. Small businesses need access to local markets and customers. If creating economic opportunity is the goal, access to resources is essential. Enhanced Collaboration – Pooled resources carry greater weight and make larger impacts. Creating economic opportunity can be better attained when public and private entities work together to solve problems. Cooperatives gain greater power in the marketplace from similar efforts. Accountability and Transparency – When programs lack accountability, resources can be wasted and goals poorly achieved. Therefore, programs for creating economic opportunity must assess results to drive change moving forward. This and transparency create trust and stakeholder buy-in essential for success. The AdvancingCities Challenge is a viable solution to the problem of stunted economic growth. With the goal of creating economic opportunity for cities, the AdvancingCities Challenge invests significant resources into communities. 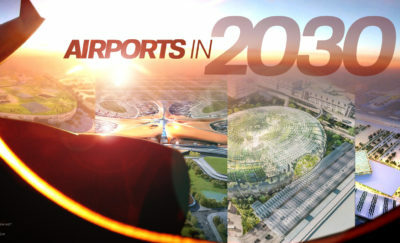 Specifically, it sets aside an investment of $500 million in up to 30 communities over the next five years. 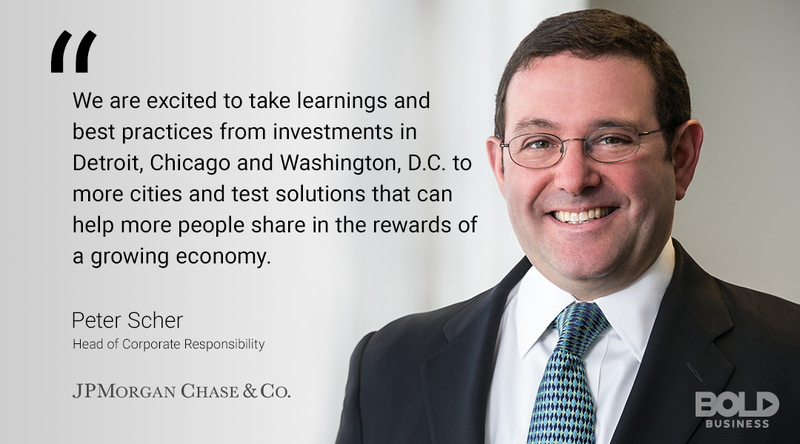 JPMorgan Chase will fund innovative solutions for inclusive growth in cities for creating economic opportunity. Funding will require solutions that embrace collaboration and sustainability concepts. In addition, solutions should foster coalitions among public and private stakeholders in the community. And key economic and social issues need to be addressed, including employment barriers and financial security. Improving economic opportunities is the name of the game, and JPMorgan Chase has shown it plays it well. 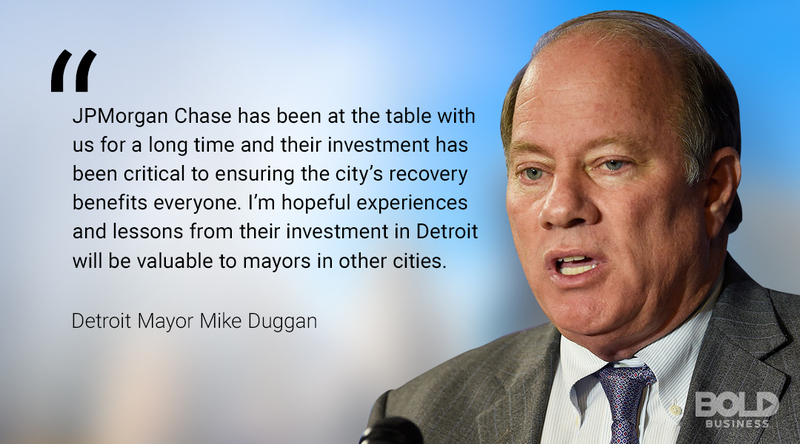 Based on JPMorgan Chase’s experience in Detroit, additional outside capital investments of $1 billion are expected. JPMorgan Chase is also making larger scale investments in global cities, like Greater Paris, where positive potential and collaboration exist and deeper investments are needed. These targeted investments are in addition to the AdvancingCities Challenge. Through these efforts, JPMorgan Chase expects to drive inclusive community growth while creating economic opportunity. The funds for AdvancingCities will be provided through lending and philanthropic funds by JPMorgan Chase. But at the same time, JPMorgan Chase is providing other support through expertise and research. Specifically, JPMorgan Chase’s Service Corps, comprised of company employees, will share their expertise with community recipients. Likewise, the JPMorgan Chase Institute will help maximize community investments through data analytics. Improving economic opportunities has benefits for both communities and the corporations that reside in them. 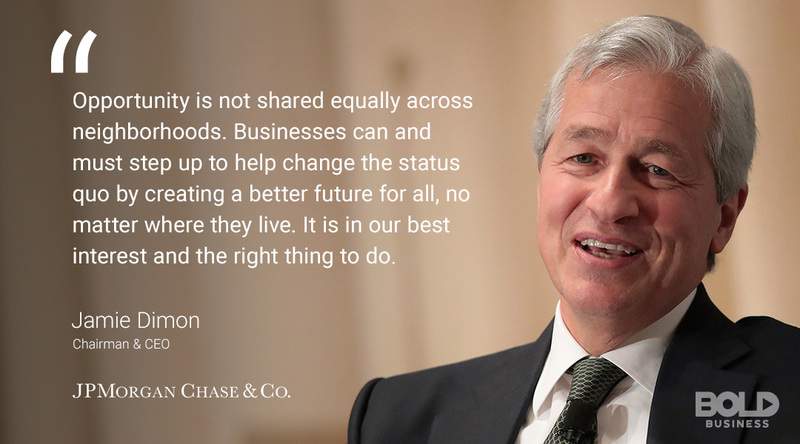 JPMorgan Chase clearly exemplifies the bold leadership style needed to effectively address major social and economic issues among communities today. Read more about JPMorgan Chase’s Chief Marketing Officer Kristin Lemkau, in her Bold Leader Spotlight.